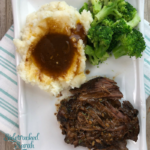 Slow Cooker Garlic Gravy Roast Beef is a Comforting, Easy Meal that is Sure to Please Your Family! Place roast in slow cooker & sprinkle with garlic. Season with brown gravy mix, salt and pepper. Pour in beef broth around roast. Slice butter into pats and place on roast. Remove and slice or shred. Serve with gravy over the top.